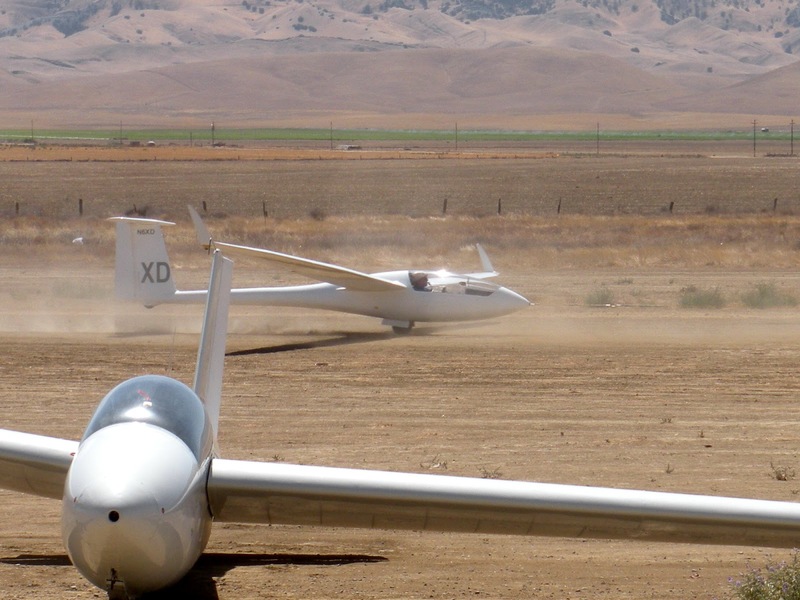 Today was a busy day with both training flights and a pseudo Cross Country Camp. Training: There were enough training flights to last most of the day. Three students in their training cycles included in order of their flights, were: Peter Suddjian, Jim Bell, and Beth Platz. 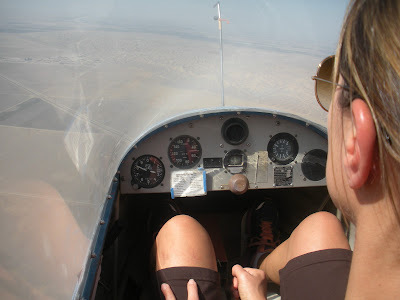 Since these flights took place all day long in and around the cross country pilots, I thought it best to group them here to allow Julie's excellent prose to be uninterrupted. 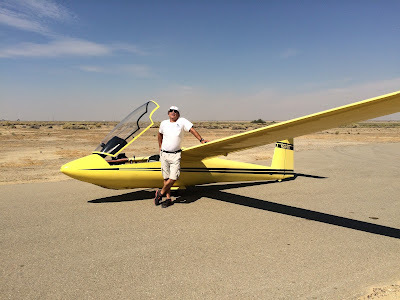 Peter Suddjian is a long time power pilot from Fresno who is moving along in his training quite well. I expect him to be taking the tow unassisted in the next flight or two. Jim Bell has had some power flight training many years ago and that shows in his capture of the skill necessary to fly well. As with Peter, I expect Jim to take the tow entirely in a few flights. Beth Platz, an M.D. 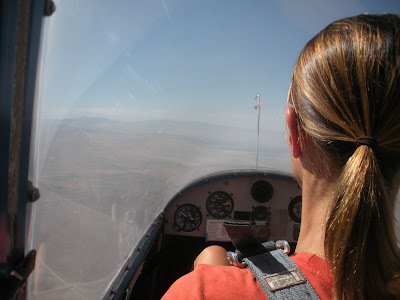 from Valley Children's Hospital, flew her second training flight and after that committed fully to joining the Club. She is now a Member in good standing in the Central California Soaring Club. She also is making good progress as I noticed small but important adjustments during her stick and rudder coordination, especially during thermalling turns. I think she'll be surprised at how quickly the flights will go right up to the day when I exit the glider and send her off on her own. 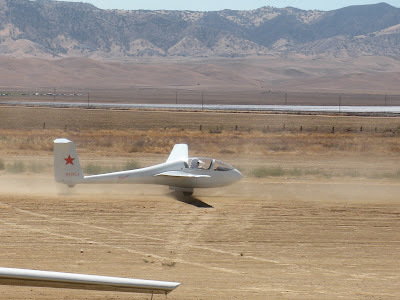 Peter Suddjian working a weak thermal but mostly practicing stick and rudder coordination. Peter Suddjian seems to be having fun flying the glider and that helps make progress. 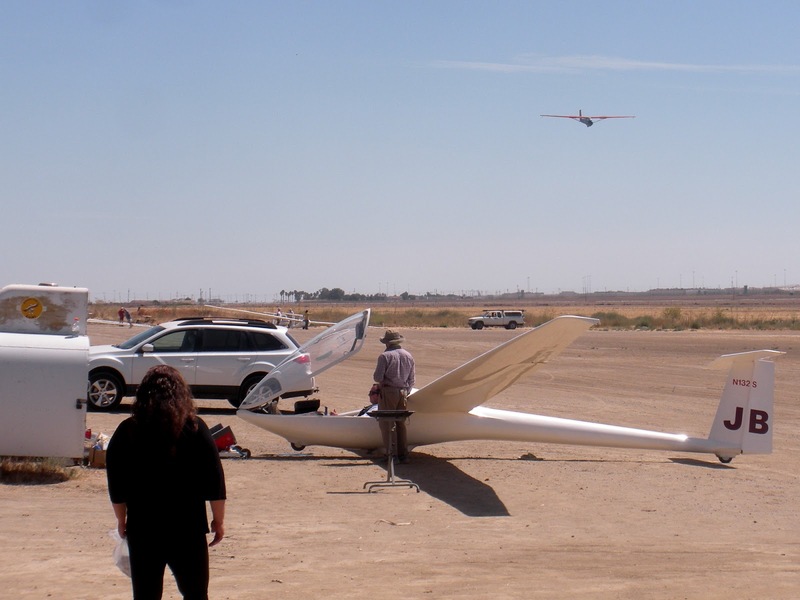 The cross country pilots are busy assembling their sailplanes in preparation for the launch in an hour or so. Andrew Palmer walking the wing of Peter Sahlberg's 1-35 enroute to the launch area. I thought I would fly the Russia. 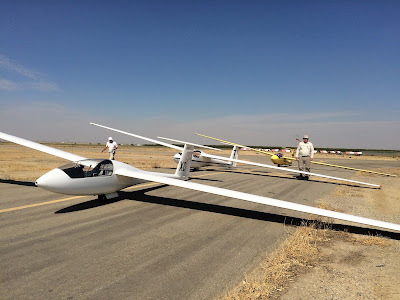 But, by the time I got to Avenal, Andy had already had it assembled, and the DG and everyone I needed to get checked out (Morgan and Alex - thanks, guys!) in it were available. Needless to say, I jumped at the opportunity. I found the assembly to be somewhat more challenging than in the case of the Russia, mainly because of the weight of the wings. Morgan says that it *can* be done by one person. One day I might try it, but for now I would rather have help. The tow was uneventful. CG hook or not, the glider was easy to fly. I wonder if it is possible to box the wake with the rope attached so far in the back? This being my first flight in the type, I opted to stay local. And the best lift was to be found was in the valley anyway. I climbed to 6000, flew along what seemed to be a convergence line, went to the Black Mountain and, to my great surprise, found absolutely nothing there. Another thing I noticed that may be related to my weight is this: when flying at 50-ish knots with full spoilers, any attempt at slipping causes the nose to drop 30 degrees or more. Then it accelerates to 60 or so and recovers. This would have scared me, had it happened on final. So, what would I rather fly? If there is a chance of landing out (in a field), I would rather be in the DG. The wheel brake is better and there are no gear doors to damage. If there is no one available to help with the assembly, or if there might be nobody at the airfield when I return, I would choose the Russia. Strong winds would probably favor the DG, and if I feel like spinning - the Russia. It's good to have options! Sergio Grajeda landing the Orange Crush. He was one of the first to launch today. I thought I'd write up a little bit on how Sergio Grajeda's mother came out on Saturday. She drove up to the gate and said she was looking for Sergio. Figuring this was probably his Mom but having never met her before, I introduced myself. Her name is Maria. Sergio was up in the Orange Crush and was getting lift and doing some soaring, so I sensed an opportunity. 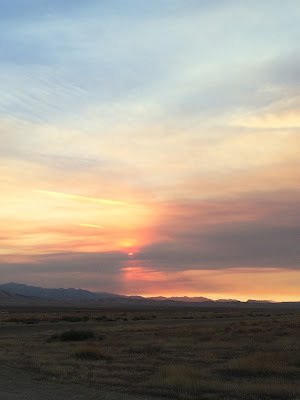 I invited her in to get out of the sun on the porch, and when she did, I pointed up in the sky to the west, where Sergio was thermaling at about 2500 ft. AGL and having no trouble staying up. I said "There's Sergio, in that glider up there by himself". Her reaction was "Oh my God! ", with her hand over her heart, and she seemed like she needed to sit down. 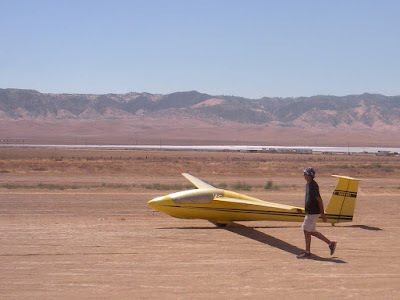 I explained that he's flying very well, and will soon be ready for a checkride for his license. I had wanted to give Sergio my wife's old cellphone today so he could learn how to run XCSOAR on it, but I had discovered the battery in it had died. But Sergio's Mom had gotten him one and brought it out to him. It looks like it will work for XCSOAR, as well as being a reliable phone he can use for regular communication. 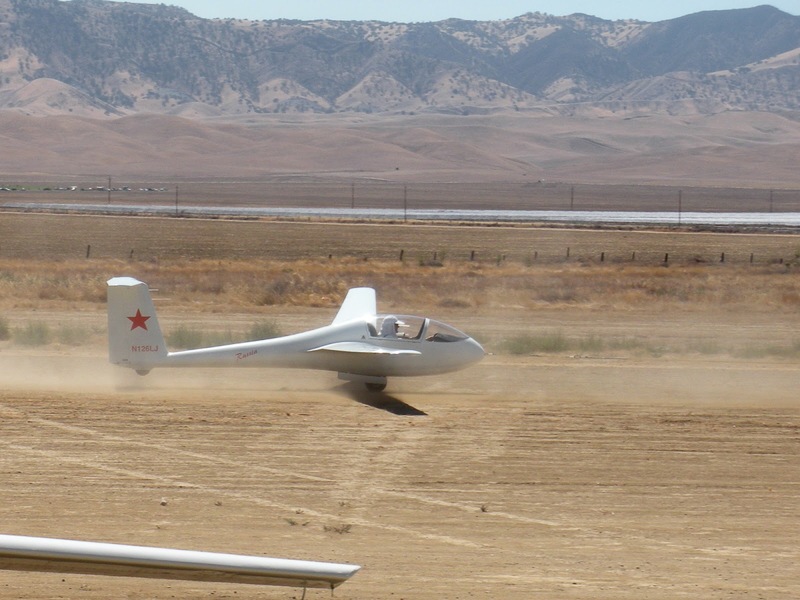 Andy Reistetter flying the Russia, but not participating in the cross country camp. Julie Butler flying XD and heading south with her students in Cross Country flying. Andrew Palmer and Troy Wollman chat while Bart Klusek works on the DG100 in the background. 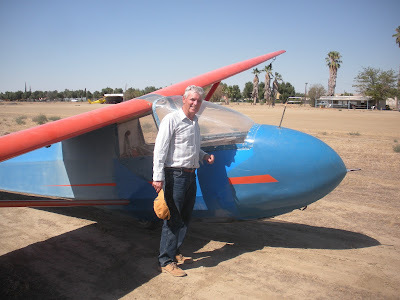 As indicated earlier in this write up, Bart had a nice relaxed time flying the DG100. 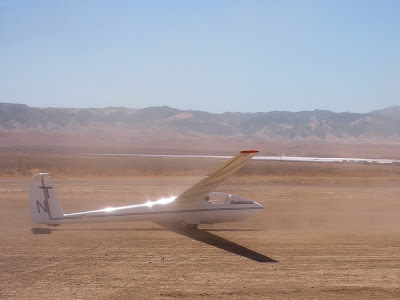 Pancho Herrera launching in his Libelle as a participant in the Cross Country Camp. Martin Caskey also launching in his Nugget as part of the group heading south on cross country flights. 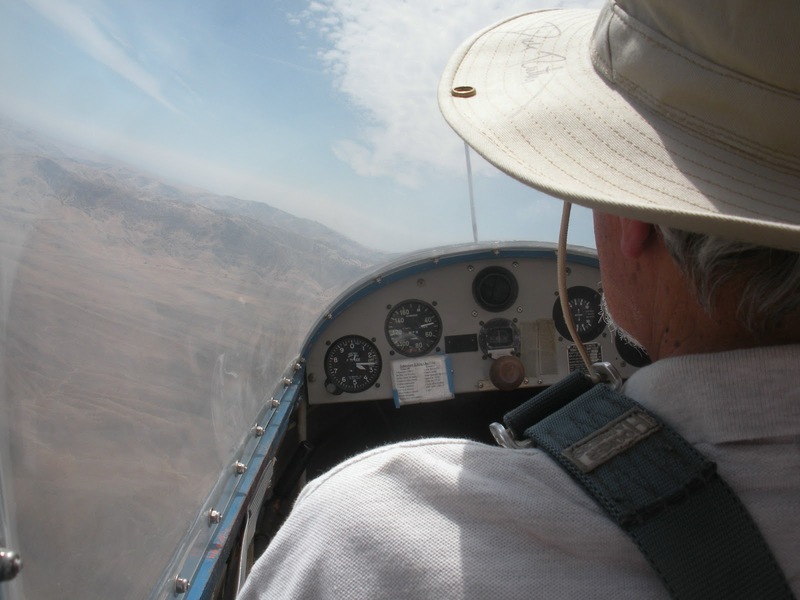 Jim Bell making a nice thermalling turn on his way up towards 5000 msl. 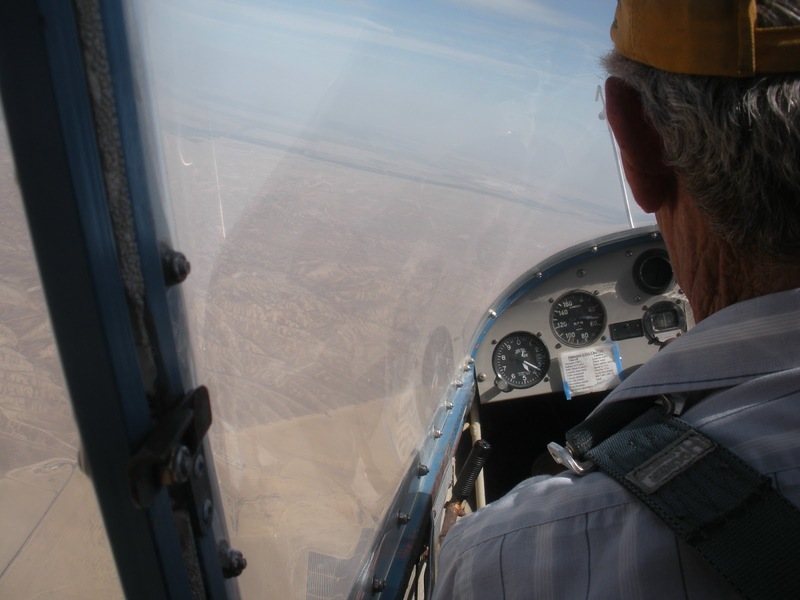 Jim Bell enjoyed his flight and the great thermal he managed to snag for high altitudes. 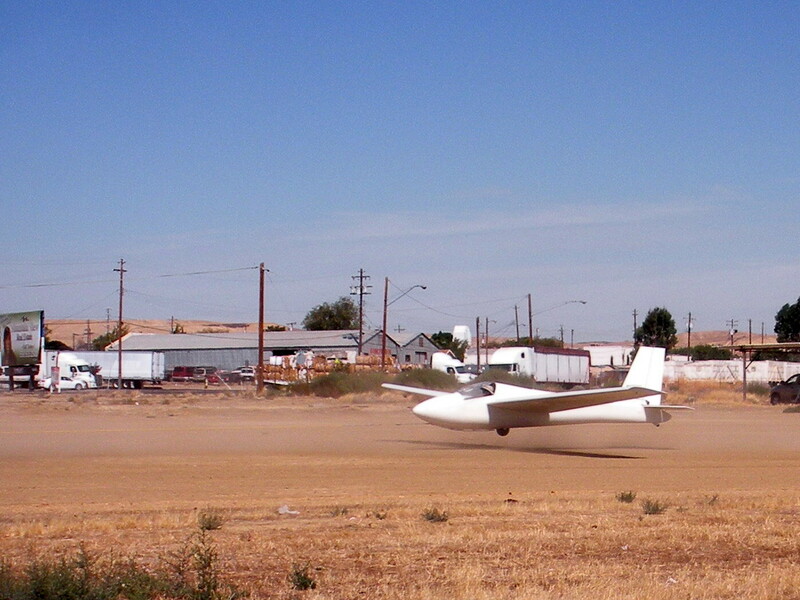 Troy Wollman launching in the 1-26 but did not participate in the cross country flying. Beth Platz searching for a good thermal while practicing her stick and rudder coordination. Beth managed to find and work a modest thermal and we were climbing well. 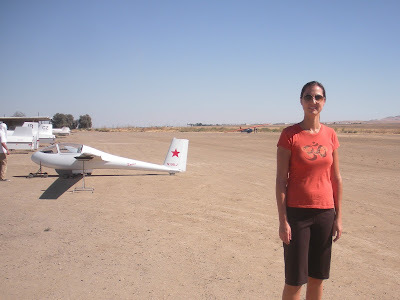 CONGRATULATIONS BETH, on becoming the newest CCSC member and student pilot. The morning started with lots of people out setting up ships and completing pre-flight inspections before a pilot briefing on the patio. Only 4 pilots showed up for the XC camp, and we decided to set a task of Taft, Porterville, Avenal with the option to do a straight out to Tehachapi if it looked like there was a chance to make it. Peter Sahlberg launched first in 181, then Julie Butler in XD, Pancho Herrera in 4M, and Martin Caskey in TN. Pancho was really excited about the first thermal he hit on tow and got off a bit early only to find himself needed a relight. 181 quickly climbed to 5000+ and headed south toward Dudley, getting there at about 3000'. XD followed behind, but on a little better line arriving at Dudley at 5000'. Not finding much there I decided to continue south toward a building dust devil - that was the last one I saw. The convergence had already moved to the east and I missed the opportunity to follow it about 15 miles back, so I soon found myself landing at Lost Hills with a stiff cross wind. Hearing Martin at Dudley, I called for him to head east, but maybe a little late. After pushing off at the first taxi way, I saw 181 east of the airport fairly low and he soon joined me on the ground and rolled out to the last taxi way. 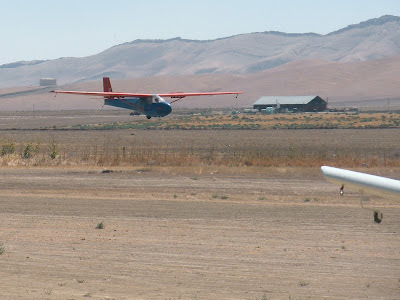 As we pushed his glider off the runway, we saw TN east of the field circling. Unfortunately, he did not get my 'go east warning' soon enough and he eventually joined us at Lost Hills for a little party complete with a welcoming committee of wild Chihuahua mixes. 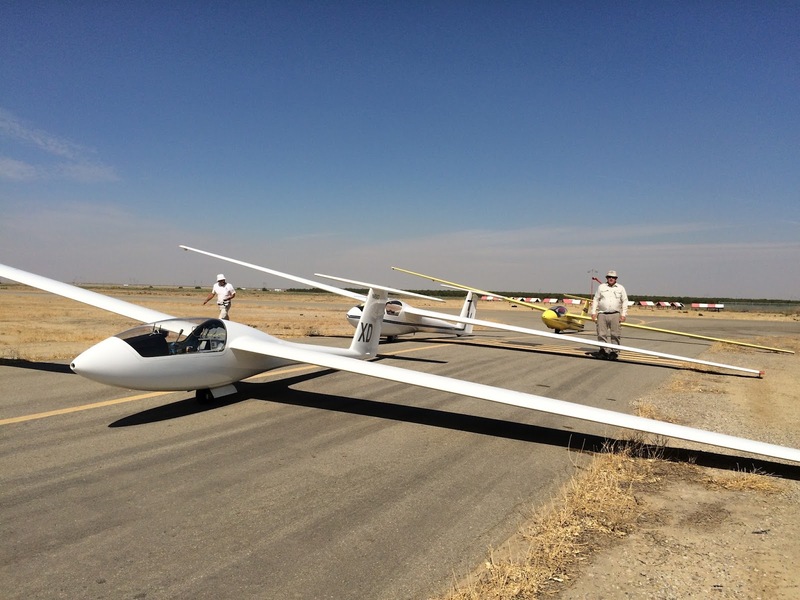 The stellar land out crews were rolling out of the Avenal airport by the time I called to let them know Martin had also joined us and they were rolling in just about the time we were ready to take off horizontals and wings. 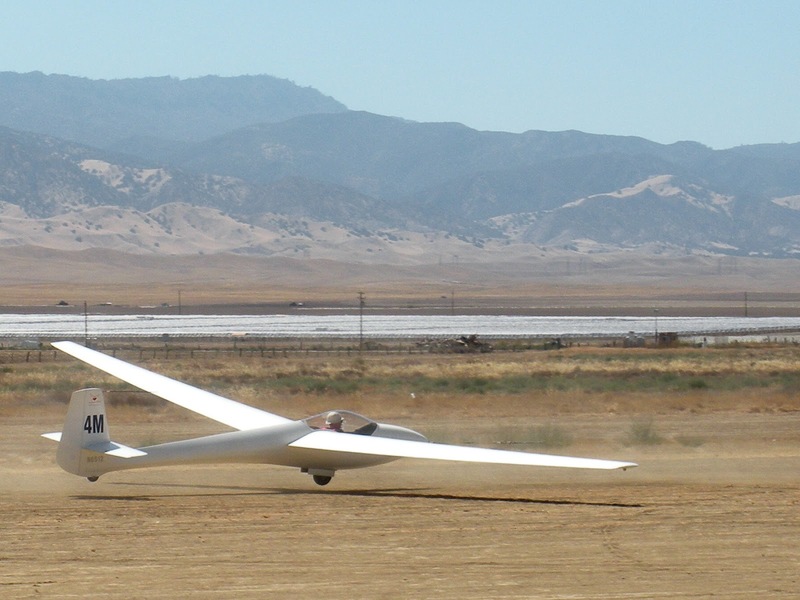 4M must have heard our demise by the time he got to Dudley and made the choice to head back to Avenal so he did not have to set his glider up again tomorrow. Peter Sahlberg after his first land out. Land out party at Lost Hills; check out the wind sock behind Martin's right shoulder. Beautiful sunset at Avenal courtesy of the Sobraneres fire. Many people camped out in Avenal Saturday night, so we enjoyed breakfast of bacon, eggs, and coffee on the patio. The forecast was a little more dismal than the prior day and no XC task was called. 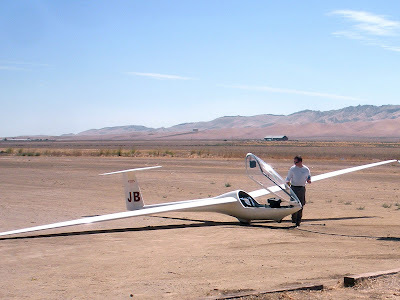 A multitude of people began work on various projects around the airport including clearing brush, cleaning airplanes, and putting Peter's SGS 1-35 back together following his land out. Jim Rickey went through the manual for the DG100 again before taking his first flights in that plane. Jim is ready for take off. Mario Pauda is waiting for the annual inspection on his new 1-26, so he flew the club's today. 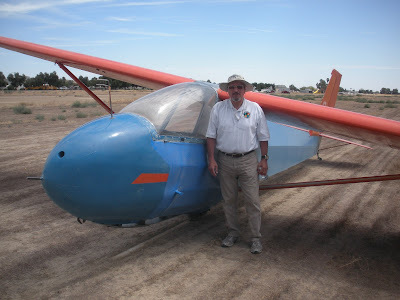 Harry Davies came out in his new Libelle 201 complete with awesome Cobra trailer and took 2 flights. 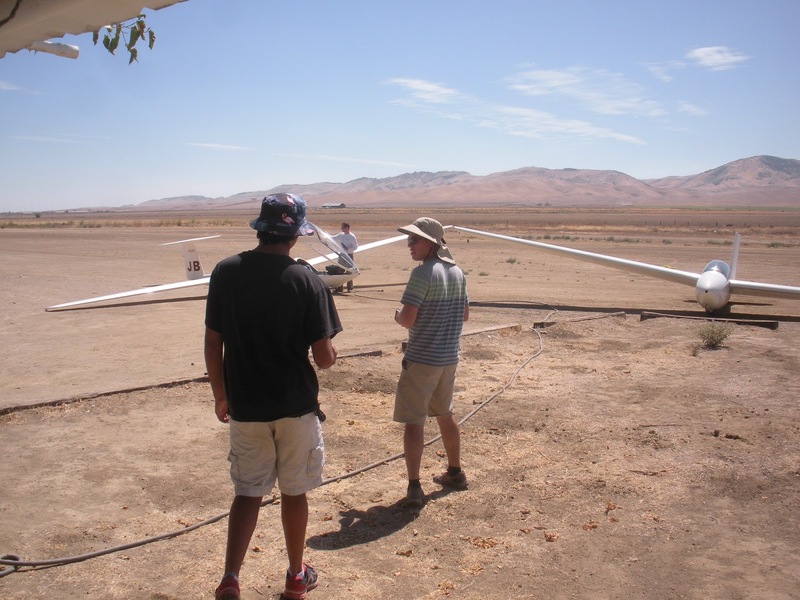 Troy Wollman and Jennifer Bauman took several flights in the 2-33 with Sergio, Luca, Jesse, & Andrew so that everyone got a chance to fly. 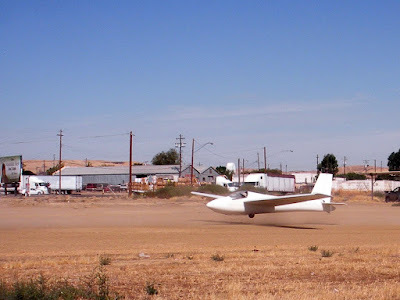 Pancho also took several flights before putting 4M back in it's box. Lizzy makes sure Mario's cockpit is ready for flight while Troy gets ready to rob a bank or run a wing. Mike Paoli was out working away, but did not get a chance to fly. Maybe next weekend. Thanks to everyone who came out to play. It was a fun weekend with a lot of learning going on.